We stopped first at the Visitor Education Center to get our bearings and use the facilities. The Park Ranger are very patient, despite the fact that they’ve probably heard the same questions dozens of times within the last hour. 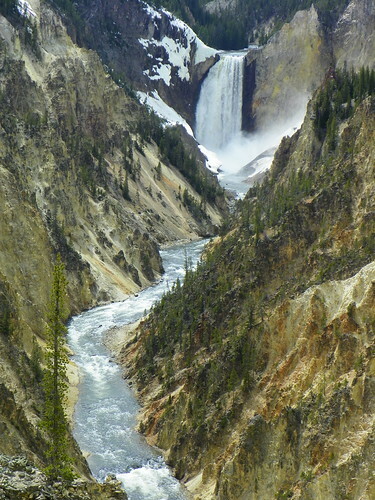 At several locations, you can see the Grand Canyon of the Yellowstone, which has colorful cliffs that plunge 1,000 ft.
Next, we headed to see the Upper Falls (109 ft. high, the materials informed us) from the special viewpoint. We could hear and see the falls – right near us and, if the viewing platform and fence were not there, the falls would have washed us away at the bend the river. Majestic and amazing! Then, we headed to South Rim Drive and stopped at Artist Point, which attracted a greater number of tourists. The view was from more of a distance of the Lower Falls (308 ft.) than we had seen for the Upper Falls. Regrouping, we traveled back to the North Rim Drive, which is a one-way road from the south, for another vantage point for the Lower Falls. We stopped at both Lookout Point and Grand View, which are not very far apart. The different perspective from each location is a great way to view them. At Lookout Point, the chemicals in the water provided a streak of color at the edge of the falls that doesn’t seem to belong, but is certainly a variation in nature. Nature is certainly nothing to discount. We enjoyed the views, and were glad of the vantage points that allowed us to see so much. 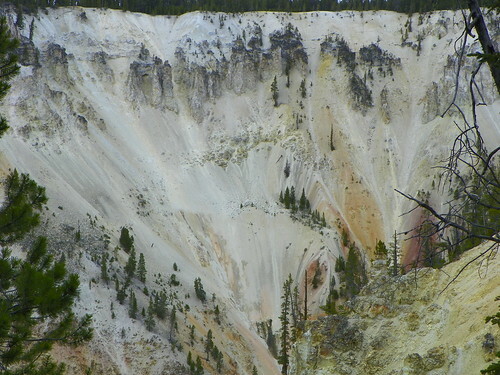 According to the Park’s literature, the “Grand Canyon of the Yellowstone plunges 1,000 feet.” The volcanic activity that is at work in other parts of the Park is also at work here and created the colorful canyons we saw. 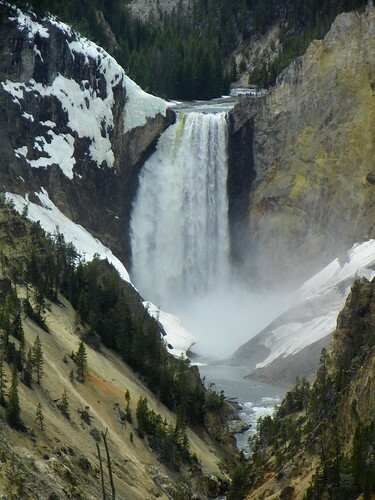 We hope you are able to visit Yellowstone, but enjoy our views! Next week… We’ll backtrack and tell you about Grand Teton National Park, south of Yellowstone. 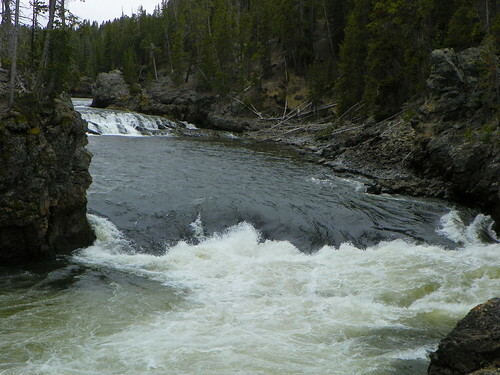 This entry was posted on Monday, July 5th, 2010 at 6:00 am	and is filed under Adventure, Family Fun, National Park, Romantic Locations, Scenery, Travel, Water feature, Yellowstone National Park. You can follow any responses to this entry through the RSS 2.0 feed. You can leave a response, or trackback from your own site.